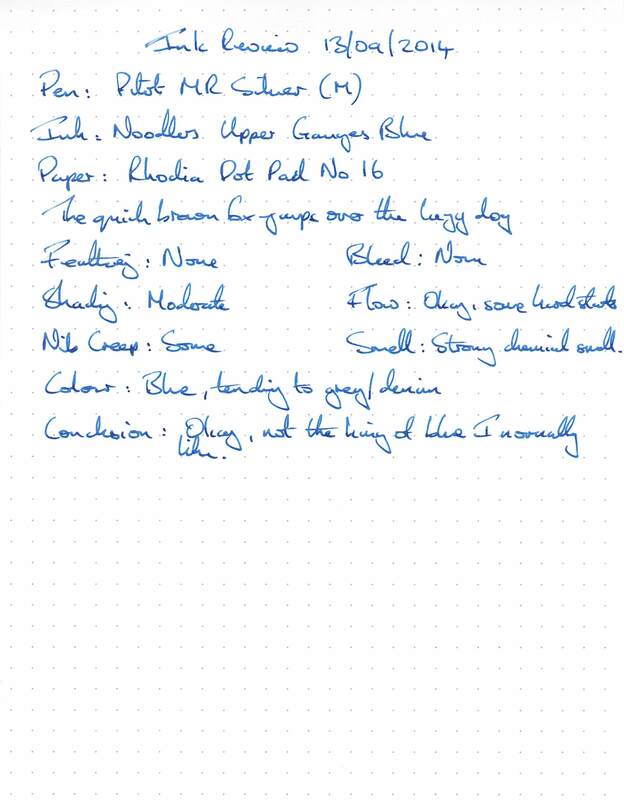 When I bought this ink I was under the impression that it was exclusive to the Goulet Pen Company, so that’s where I bought it from, although I can find no reference to that now. That being said, I can’t find any other suppliers who stock it either. At $18.50 the 3oz bottle was more expensive than usual, but still within the range of what I would consider to be moderately priced. 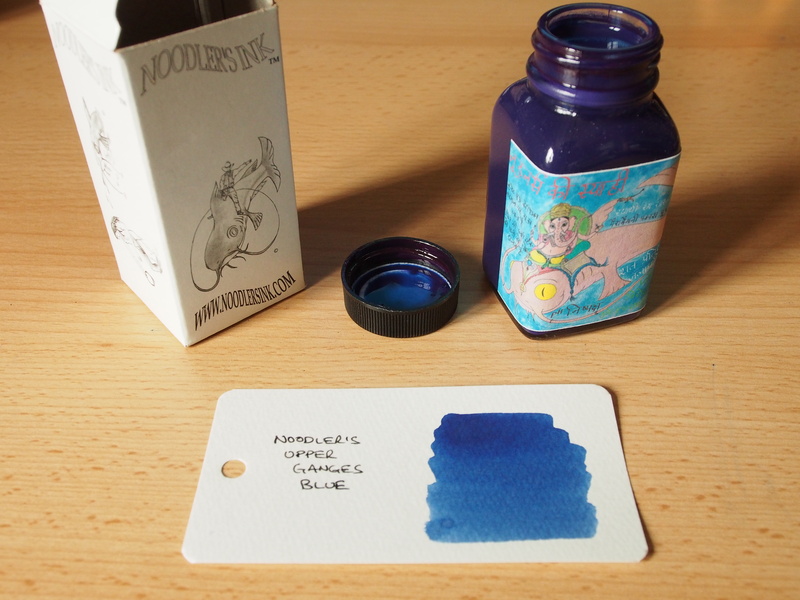 The bottle and box are of the standard type. The label is more difficult to interpret that usual. 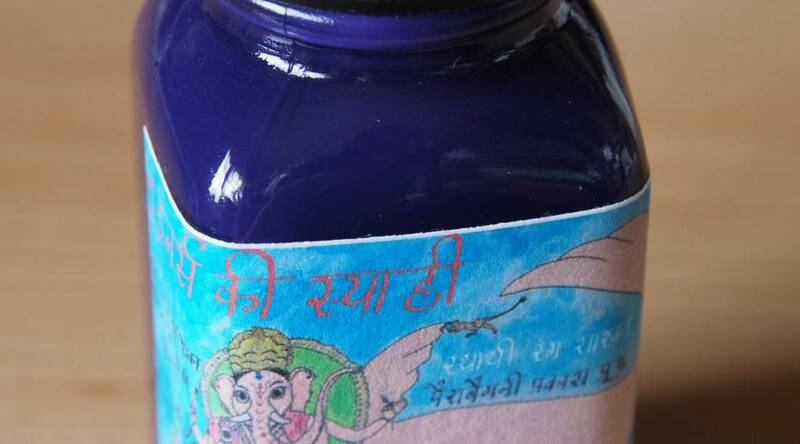 The hand drawn label shows what I take to be the Hindu God Ganesha riding on the back of a giant catfish. Almost all of the text on the label is in Sanskrit, apart from “pH” and “USA”, and I wouldn’t know where to start trying to translate it. I’ll leave that as an exercise to those who know the language. 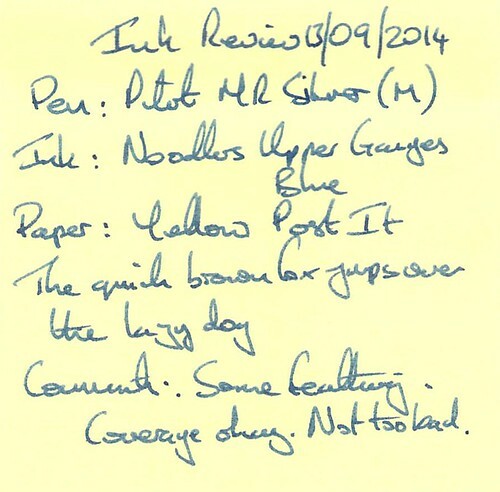 In the bottle the ink has a distinct purple tinge to it, which disappears when used. Drying time was the shortest in this batch, at around 20 seconds. Water resistance was good. Cleaning was a little more tricky than usual with what I can best describe as a few blue “clots” present in the feed. 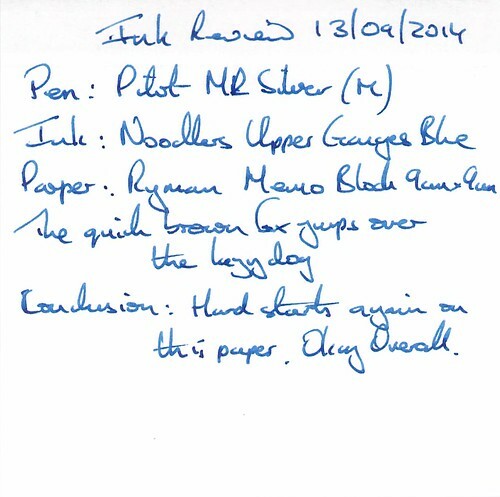 This inks leans more towards grey, and I did find note some hard starts. Possibly not my favourite blue, but not disagreeable either. 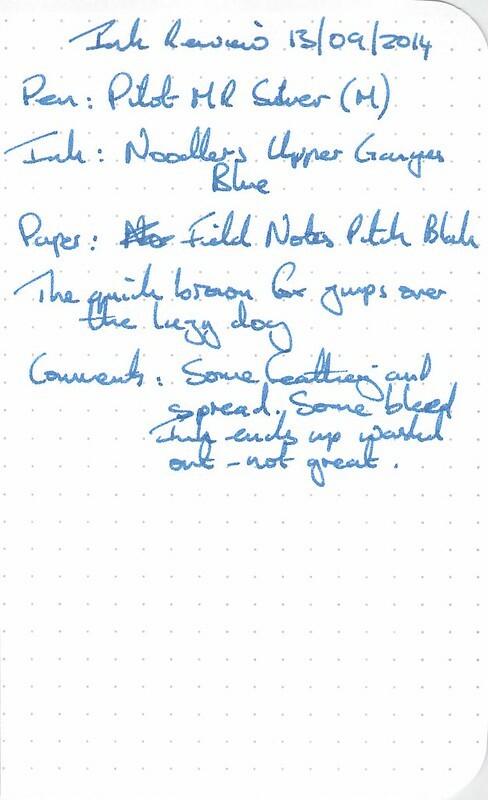 More hard starts, but the ink actually looks a little better on this paper. Feathering noted, but still okay overall. Feathering, bleed and a washed out appearance. 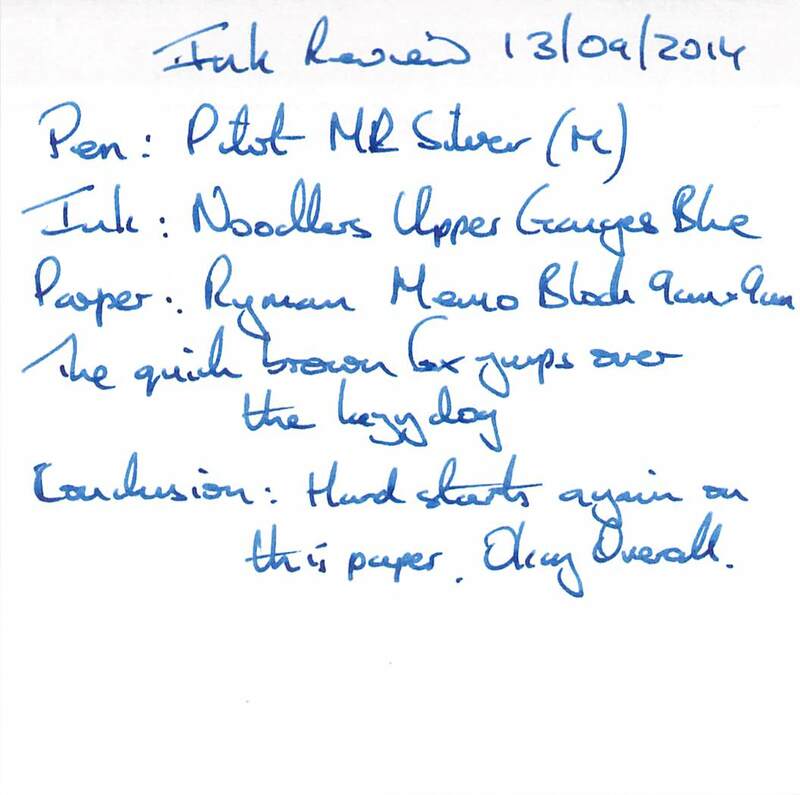 Not an ink for this papaer. 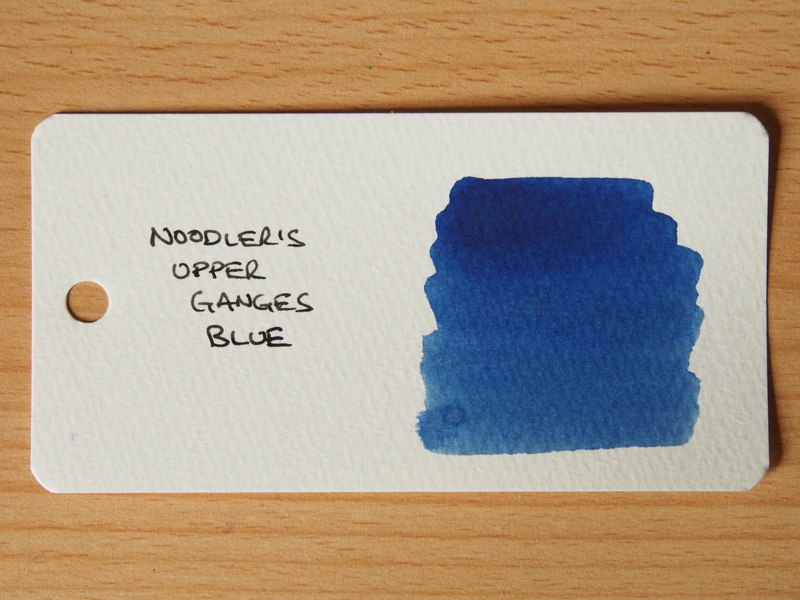 Looks quite good on a Word Card – if I went on this aloneI would be more positive about this ink. In normal use this ink is a little too understated for my tastes. However it’s water resistance and quick drying time are positives, and it could well go into rotation from time to time. Bulletproof ink, dries on paper but can easily be washed from plastic. Thanks for the information. Once outside the Latin alphabet my knowledge of languages is effectively zero.